The Department of General Services (DGS) owns and maintains 58 office buildings across the state totaling more than 16 million square feet. The department has struggled to consistently maintain these facilities, and the current backlog of maintenance projects totals $138 million. The Governor’s budget provides a one–time increase of $5 million from the General Fund towards addressing DGS’ deferred maintenance backlog in 2015–16. The purpose of this report is to not only assess the Governor’s budget request, but to also more broadly evaluate the funding and management of DGS’ facility maintenance program. Governor’s Proposal Good First Step to Protecting Investments in Buildings. The state has invested billions of dollars to construct its office buildings around the state. When these buildings are not properly maintained and deferred maintenance develops, it can result in significant repair costs in the future and a shorter useful life of the buildings. Therefore, it is important that the state address its substantial accumulated deferred maintenance backlog at DGS facilities. The Governor’s proposal is a step in the right direction. However, by itself, the proposed $5 million will only address a small share of the identified problem, and it does not address the underlying causes of deferred maintenance in DGS buildings. Various Contributors to Deferred Maintenance Still Need to Be Addressed. Based on our review, we identify four key factors that contribute to the accumulation of deferred maintenance in DGS buildings. Potential Understaffing for Maintenance. There is potential understaffing of maintenance positions for some DGS buildings. Specifically, some state buildings are relatively understaffed compared to other buildings. We also find that vacancies—particularly in certain areas of the state—also contribute to challenges completing needed maintenance work. Recent Reductions to Maintenance Funding. During the recent recession, the amount of funding available for maintenance was reduced. In fact, the rental rates charged to many state agencies in DGS buildings for facility operations and maintenance are still lower than they were prior to the recession. Inadequate Prioritization of Workload. There is also an inadequate focus on preventive maintenance, an activity that can reduce the chances of equipment failures and more expensive repairs later. This is due in part to the department’s underutilization of its workload tracking system, as well as staffing difficulties that make it challenging to complete preventive maintenance activities. Limited Contracting Authority. While the department has existing authority to contract for certain services, it faces constraints in its ability to do so in some cases. Specifically, DGS does not have authority to use job order contracting like certain other departments, and is limited in its ability to contract for maintenance staff when persistent vacancies occur. We also find that DGS is not currently (1) adequately tracking the needs and performance of each of its buildings, (2) tracking its spending on facility maintenance activities, and (3) using benchmarks to compare its maintenance performance to outside standards. These best management practices are important to ensuring cost–effective stewardship over these buildings. LAO Recommendations. We provide several recommendations to reduce the deferred maintenance backlog and address the ongoing contributors to the backlog. First, we recommend approval of the $5 million requested, pending additional information from the administration. Specifically, we recommend the Legislature require DGS to identify the specific projects that would be funded in order to ensure consistency with legislative priorities. We further recommend that the department develop a long–term plan for addressing the remaining portion of the existing backlog. Second, the department should take steps to address the factors that lead to the accumulation of deferred maintenance. Specifically, this should include (1) evaluating building maintenance staffing levels and setting rental rates to meet ongoing building needs, (2) utilizing its existing analysis tools to better prioritize maintenance efforts, and (3) taking steps to streamline the contracting process in certain circumstances where the department already has contracting authority. Third, we provide recommendations to improve the department’s practices related to maintaining state facilities, including better tracking of building conditions and maintenance spending, as well as benchmarking maintenance spending and outcomes. While these recommendations do not directly address contributors to the accumulation of deferred maintenance, we find that, if implemented effectively, they could assist the department in gathering adequate information and conducting analyses to facilitate more effective maintenance practices in the future. The DGS owns and maintains 58 office buildings across the state. The department estimates that its office buildings face a backlog of deferred maintenance totaling $138 million. In this report, we (1) provide background on the maintenance of DGS facilities, (2) review the Governor’s budget proposal to begin to address this backlog, (3) provide an assessment of the contributors to DGS facility maintenance problems, and (4) provide recommendations to effectively reduce the backlog and address the ongoing contributors to the backlog. In preparing this report, we spoke with a number of DGS staff in order to gain an understanding of the challenges associated with maintaining state office buildings. We also visited several state office buildings and analyzed data that the department provided us on its buildings. Additionally, we spoke with outside experts on public and private building management to better understand industry best practices for managing and maintaining office buildings. For the purposes of this report, maintenance does not include other activities that are not as connected to maintaining the long–term condition of facilities, such as groundskeeping and janitorial services. Additionally, this report does not focus on facility upgrades, such as energy and water efficiency projects or other changes necessary to bring facilities up to current building codes and standards (such as those related to the Americans with Disabilities Act). Maintenance Is Important to Protecting Investments in Buildings. When buildings are not properly maintained and deferred maintenance develops, it can result in significant repair costs in the future and a shorter useful life of buildings. For example, failure to patch small leaks in roofs can lead to water damage and premature roof replacement. If maintenance is delayed for an extended period of time, it can even result in the premature need to reconstruct or replace buildings. Depending on the nature of the problem, facility repair and replacement can be many times more expensive than if the routine maintenance had been performed early on. For example, a study by a private sector building management company estimated that the return from investing in preventive maintenance on certain high value pieces of equipment—such as boilers and some chillers—exceeded 500 percent. Building Maintenance Requirements Can Vary. The levels of maintenance a building needs to remain in good condition can vary based on a number of factors, including building age, type (high rise versus low rise), size, design, location, use, and the level of past maintenance services. For example, as buildings age, their maintenance needs generally increase. Many building systems—such as plumbing, electrical wiring, elevators, roofs, and HVAC systems—deteriorate with age and eventually need to be replaced or refurbished, thus contributing to higher maintenance costs. In addition, the level of maintenance provided can vary depending on the demands of tenants, such as the degree to which they are willing to accept longer response times for certain maintenance services. DGS Maintains Large Portfolio of Office Buildings. The DGS owns and maintains 58 office buildings that total over 16 million gross square feet. (The department also provides some services—such as building engineering or custodial services—to close to 200 “partial services” buildings that are under the control of other state agencies.) The DGS buildings are located across the state, but roughly two–thirds of the square footage of the buildings is in the Sacramento region. Other major metropolitan areas with a relatively large number of DGS buildings are the San Francisco Bay Area and the Los Angeles area. DGS Buildings Are Aging. The DGS buildings vary widely in age. However, DGS has a concentration of older buildings. 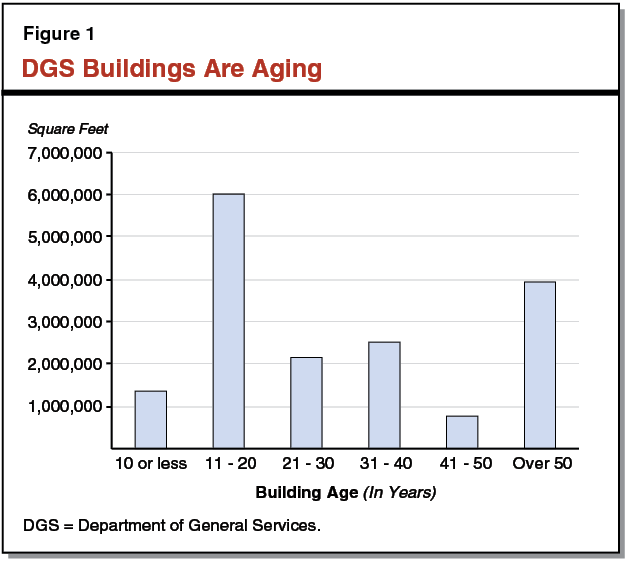 As shown in Figure 1, more than 40 percent of the total square footage—representing over 7 million square feet—of DGS building inventory is over 30 years old. (About 60 percent of DGS buildings are over 30 years old.) Almost one–fourth of the square footage—about 4 million square feet—is over 50 years old. While some of these older buildings have been renovated in recent years (such as the Library and Courts Building in Sacramento), others are still largely in their original condition. Rental Rates Are Main Source of Funding for Building Maintenance. The DGS funds building maintenance costs, in addition to other costs associated with operating buildings (such as custodial and groundskeeping services), by charging monthly rental rates to the state departments that are tenants in these facilities. For the purposes of setting rental rates, DGS has established two main categories of buildings based on whether they have outstanding bonds: (1) Individual Rental Rate (IRR) buildings (still have outstanding lease revenue bonds), and (2) Building Rental Account (BRA) buildings (do not have outstanding bonds). The DGS charges state agencies that are tenants in IRR buildings specific rental rates. As shown in Figure 2, these rates range from $1.89 to $8.54 per square foot per month in 2014–15. The IRR building rates include debt–service costs for the building, as well as DGS’ maintenance and operations costs. The DGS generally charges state agencies that are tenants in the BRA buildings a statewide standard building rental rate, which is $1.73 per square foot per month in 2014–15. aCertain BRA and IRR buildings are served by the Central Plant and pay an additional $0.59 per square foot per month to cover costs associated with that facility. bIncludes the California Public Utilities Commission building, since this building’s bonds were repaid in 2013. However, DGS indicates that it is charging an additional $1.42 per square foot per month for this building due to deferred maintenance on the building. DGS Funds Different Types of Maintenance Activities. The department budgets its maintenance activities into three general categories—personal services, special repairs, and recurring maintenance. However, as described below, these categories also include some non–maintenance activities. The DGS does not break out the portion of these categories that can be attributed specifically to maintenance. Personal Services. Personal services funding pays for staff positions for building maintenance (such as stationary engineers) and other operational activities (such as groundskeepers, custodians, and administrative support personnel). Recurring Maintenance. Recurring maintenance funding is used to pay for a variety of operational activities and supplies, including those that we do not classify as maintenance (such as custodial supplies). Special Repairs. Special repairs funding pays for larger maintenance items that cannot be accommodated in a building’s recurring maintenance budget. Special repairs projects are typically performed by contractors. In some cases, special repair funding is also used to fund other, non–maintenance activities, such as energy efficiency improvements. While DGS does not budget specifically for maintenance activities, we reviewed data provided by the department to estimate its maintenance spending. We estimate it spent roughly $60 million in 2013–14 on maintenance, with most of this amount spent on personal services and special repairs, as shown in Figure 3. We also estimate that DGS employs roughly 300 people to maintain its 58 state office buildings. Commonly used maintenance classifications are engineers, mechanics, electricians, and plumbers. aAmount includes savings from other budget categories (such as salary savings) that were redirected to special repair budget. DGS = Department of General Services. DGS Has a Work Order Tracking System. The DGS has an industry–standard work order system (known as Maximo) to track work orders and manage the preventive maintenance schedules for all major building components—or assets—such as chillers, boilers, and pumps. For instance, the system generates work orders when preventive maintenance items are due or when building staff or tenants report building maintenance needs. The DGS maintenance staff charge their time to these work orders and can close them out when they finish them, or staff can defer these work orders when they are not able to complete them as scheduled. The system is also designed to identify patterns of equipment failure, in order to predict potential future problems with building systems and inform staff on what preventive actions they might want to take. The Governor’s budget for 2015–16 identifies DGS’ backlog of deferred maintenance as $138 million. This represents more than twice our estimate of total annual maintenance spending on these buildings. The department’s list of backlogged projects is categorized by priority level and includes a range of activities. Figure 4 summarizes the department’s backlog of projects. These activities range from more critical ones, such as repairs to major building systems (for example, roofs and heating and cooling systems), to less critical projects, such as carpet replacements and office repainting. Since DGS does not have a recent statewide survey of building conditions, there is some uncertainty regarding the department’s precise amount of backlog. However, it is clear that various state buildings have significant issues, such as water leaks, aging or inadequate heating or air conditioning systems, and unreliable elevators. This problem is also longstanding and has been documented in reports by our office as well as the Little Hoover Commission since at least the 1990s. aList includes $11 million specifically for the Board of Equalization Building to meet various maintenance needs (such as for heating and cooling systems, security, and plumbing) as identified in a recent study. The Governor’s budget provides a one–time increase of $5 million from the General Fund towards addressing DGS’ deferred maintenance backlog in 2015–16. This funding is part of a larger package of proposals totaling $125 million for deferred maintenance activities across various state departments. (Please see our report The 2015–16 Budget: The Governor’s General Fund Deferred Maintenance Proposal for more information about these proposals.) At the time this report was prepared, DGS had provided a list of potential projects proposed for funding totaling $7.9 million. The $7.9 million list includes 26 projects at various state buildings, such as HVAC repairs and replacements, and plumbing repairs. In this section, we review the Governor’s budget proposal on DGS’ deferred maintenance backlog. We also identify several contributors to the development of the backlog, including potential understaffing, funding reductions, inadequate prioritization of workload, and contracting barriers. Finally, we identify several best practices for building maintenance that DGS is currently not employing. Proposal Is Positive First Step . . . We find that it is of great importance that the state address its substantial accumulated deferred maintenance backlog at DGS facilities given the state’s significant investment in these facilities, as well as the potential for significant future costs when repairs are delayed. The $7.9 million list provided by DGS appears reasonable as it focuses on high–priority projects that should help address critical needs and potentially reduce future state costs. For example, the most expensive projects on the list are (1) an air handler unit for the Employment Development Department building, (2) cooling towers and chillers for the California Public Utilities Commission building, (3) chillers for the San Diego State building, and (4) roofing for the Department of Justice building. Together, these four projects account for more than half of the $7.9 million identified and each would address a critical building need where failure to make the proposed upgrade could cause significant problems in the future. In addition, most of the other proposed projects are related to building HVAC systems, plumbing systems, electrical systems, or fire protection systems. However, at the time of the preparation of this report, the department had not yet refined its list to $5 million and selected specific projects for funding. In our recent report on the Governor’s larger package of deferred maintenance proposals, we recommend that the Legislature require individual departments to report at budget hearings on the specific projects they propose to fund, and that the specific projects ultimately approved by the Legislature be listed in the Supplemental Report of the 2015–16 Budget Package.
. . . But Does Not Include Long–Term Plan for Reducing Backlog. Providing additional one–time funding, while a step in the right direction, is only a partial response to the problem. This is because the administration has not identified a long–term plan for addressing the rest of the deferred maintenance backlog of DGS buildings. In particular, the administration has not identified a funding strategy for reducing the remainder of the estimated $138 million backlog of deferred maintenance projects. Developing such a strategy is complicated, in part, because the department’s identified deferred maintenance backlog is a point–in–time estimate that will change over time as deferred projects are completed using existing funding sources and as new maintenance needs emerge. Because it is unknown how many new deferred maintenance issues will emerge each year, it is difficult to predict how much of DGS’ current resources will be available to work away at the existing backlog and thus how much additional funding would be necessary to fully address the backlog. This problem is exacerbated by the fact that DGS has not tracked its maintenance backlog in a consistent way over time. However, given the large size and long history of the deferred maintenance backlog at DGS buildings, it seems likely that the existing base funding is very likely not sufficient to reduce the current backlog. We note, for example, that even if the department could devote $10 million per year from its existing resources to address the backlog, it would take more than a decade for it to eliminate the backlog that is currently identified. Moreover, as state buildings continue to age and deteriorate, more maintenance projects will emerge, meaning that there is a distinct possibility that the maintenance backlog will further increase without a long–term plan to address the problem. In addition to tackling the existing backlog of deferred maintenance, it is also important to address the underlying causes of the problem in order to ensure that state buildings are properly maintained on an ongoing basis. Based on our review, we identify four factors that we find to be contributing to the accumulation of deferred maintenance: (1) potential understaffing of some buildings, (2) recent cuts to DGS’s maintenance budget, (3) inadequate prioritization of workload, and (4) limited contracting authority. Variation in Building Maintenance Staffing. We find that some state buildings are relatively understaffed compared to other buildings. As shown in Figure 5, there is quite a bit of variation in maintenance staffing across certain IRR buildings (the ones for which we have data). While most buildings have about two maintenance personnel per 100,000 square feet, one building has less than one staff per 100,000 square feet and another has more than nine staff per 100,000 square feet. Other data provided by DGS covering the department’s 42 largest buildings in 2011–12 shows the wide variation in the number of hours used to maintain buildings. On average, close to 2,500 hours were spent maintaining each 100,000 square feet of building space, but there were 15 buildings with fewer than 1,500 hours and seven building with more than 3,500 hours spent per 100,000 square feet. The above differences in staffing levels might reflect, in part, differences in needs—since some buildings are older or have unique maintenance requirements. For example, some buildings do not have certain on–site building systems and related staff because they receive chilled water for cooling and steam for heating from the Central Plant. However, the extent to which some buildings are understaffed to perform preventive and corrective maintenance in a timely fashion is likely contributing to deferred maintenance. The DGS has not analyzed the degree to which each of its buildings currently has the appropriate level of maintenance staffing. Although the department indicates that it believes this would be a worthwhile activity, it has not completed this evaluation due to resource constraints. Vacancies Contribute to Understaffing in Maintenance. Vacancies also affect DGS’ ability to perform needed maintenance activities. The department reports challenges filling certain maintenance positions because state salaries are uncompetitive with those offered in the private sector. In 2013–14, the overall vacancy rate for maintenance positions was estimated at 14 percent, but this rate is significantly higher or lower for some classifications, as shown in Figure 6. (These vacancy rates were calculated based on data that includes both DGS buildings and partial services buildings.) For example, two of the most commonly used maintenance classifications are maintenance mechanics and stationary engineers. About 3 percent of maintenance mechanic positions were vacant, while 16 percent of stationary engineer positions were vacant. Vacancies can be especially problematic in certain areas—especially in the San Francisco Bay Area and Southern California—since state salaries generally do not vary depending on regional cost of living. For example, the vacancy rate for stationary engineers in the Bay Area was roughly 30 percent. These vacancies result in lower capacity to conduct maintenance work because there are fewer staff on site. aIncludes all Building and Property Management Branch maintenance positions, including staff for partial services buildings. bIncludes, for example, Stationary Engineer Apprentice, Electrician II, and Carpenter I and II. The DGS funding level for maintenance has varied over time. In large part, this variation has been a product of downturns in the state’s budgetary situation. During the recent recession, DGS reduced rental rates in order to relieve costs to other state departments. For example, BRA rates were reduced by over one–third, from $1.80 per square foot per month in 2008–09 to $1.12 per square foot per month in 2011–12. Since 2011–12, BRA rates have increased, but have not yet reached the levels they were at prior to the recession. Thus, DGS had less funding over this time period for the maintenance and operations of state buildings. Consequently, between 2008–09 and 2013–14, we estimate that this resulted in a reduction of about 7 percent of its budgeted maintenance positions. The department indicates that staff reductions, vacancies, and employee furloughs during this time contributed to increasing the backlog of deferred maintenance. The department does not systematically prioritize preventive maintenance. On average, based on the most recent available data, 30 percent of DGS maintenance hours are spent on preventive maintenance. This is at the low end of what is typically considered appropriate by industry standards, which recommend spending 30 percent to 50 percent of time on preventive maintenance activities. Moreover, in some state buildings managed by DGS, less than 10 percent of hours go towards such activities. Furthermore, based on data from DGS’ Maximo system covering 35 DGS buildings, between July 2013 and November 2014, more than 40 percent of preventive maintenance activities on buildings or equipment were deferred or otherwise not completed as scheduled. In some cases, these preventive maintenance tasks were planned for equipment of high value, which should be prioritized in order to reduce the likelihood of expensive future repairs and replacements. For example, over that period of time, nearly one–third of preventive maintenance activities on chillers in these buildings were not completed. Prioritizing preventive maintenance is important because it can reduce the chances of equipment requiring larger, corrective maintenance repairs later. It can also prolong the life of equipment and reduce the need for equipment replacements. Thus, by reducing larger equipment repairs and replacements, preventive maintenance can reduce the amount of overall resources that are required to maintain a building. We find that there are a couple of factors that contribute to DGS’ inadequate focus on preventive maintenance. First, the DGS currently underutilizes the capacity of its Maximo system to prioritize workload and to focus on tasks that predict and prevent failures of critical equipment. The department reports that this is due, in part, to lack of staff for the Maximo system. The DGS’ staffing for the Maximo system was cut from five positions to one during recent budget cuts. This remaining position is responsible for maintaining the system statewide and conducting training as well as other activities. The department reports that the limited Maximo staffing level hampers its ability to run specialized reports—such as trend analyses on preventive maintenance activities and other analysis that can assist prioritizing workload—and that it was able to do more often when it had additional staffing. Second, in part, the staffing and vacancy problems cited above may contribute specifically to the department’s challenges addressing all of the scheduled preventive maintenance activities. This is because when staff levels are lower than they should be, staff are not able to meet all the competing demands for conducting preventive maintenance, corrective maintenance, and addressing tenant needs. The result is that many preventive maintenance tasks are being deferred. Existing Contracting Process Can Be Cumbersome. Currently, DGS has authority to contract for maintenance services in certain instances. Based on our conversations with DGS staff, we find that the department faces constraints in its ability to contract for these maintenance services. This can make it more difficult for the department to complete maintenance work efficiently, further contributing to deferred maintenance. For instance, staff have indicated that the state contracting process is slow and difficult to manage, particularly for jobs that are relatively small, but are above the department’s normal workload (such as repainting office space when departments move). While the department can contract for these activities, the typical state contracting process involves writing detailed specifications, preparing a request for proposal, and reviewing bids for each project. Key building maintenance staff such as building engineers are typically involved in writing specifications and overseeing the contract process, so the time that they spend on these activities takes them away from other maintenance activities. In this type of situation in which the department is already allowed to contract, there may be steps that can be taken to make the process more efficient. For example, unlike DGS, some state entities (such as the courts and the California Military Department) have statutory authority to use additional contracting options, including “job order contracting”—a method in which contractors bid on a set of individual tasks and then are available on call to complete those tasks at that preestablished price. According to these entities, job order contracting can provide time savings for relatively small, simple projects because the department does not have to rebid each individual project. There is, however, typically time required up–front to select the job order contractors and establish prices. Limitations on Authority to Contract to Address Persistent Vacancies. Additionally, under existing law, DGS is limited in its authority to contract for certain maintenance activities. These limitations may make it more challenging for the department to consistently address building maintenance needs. Specifically, DGS reports that state law restricts its ability to hire contracted staff to backfill for vacancies except when the department can demonstrate multiyear vacancies or significant risk to buildings or safety. Consequently, the department reports that it has only been able to enter into an emergency employee maintenance contract once in recent years. The department indicates that such contracts could be used more often, especially for positions that are the most difficult to fill. Based on our review of relevant literature and discussions with outside experts, we identified several activities that are important for managing and maintaining buildings. The department does not follow some of these best practices including (1) tracking of building needs and performance, (2) tracking of maintenance spending, and (3) use of benchmarks. These best management practices are important to ensuring cost–effective stewardship over these valuable state assets. The department’s failure to follow these practices might indirectly contribute to its deferred maintenance backlog. This is because it is difficult for the department to ensure that it is investing the appropriate amount of resources in building maintenance or using its maintenance resources in the most cost–effective manner if it is not systematically tracking building needs and maintenance spending and comparing it to standards. In order to effectively prioritize maintenance projects and develop maintenance schedules, it is important to understand the specific maintenance needs of each building. This requires regular facility condition assessments. Despite its importance, DGS does not regularly complete such assessments. Instead, most building maintenance needs are identified by building managers and tenants on an ad hoc basis as they conduct their regular activities. Thus, the resulting identified needs are not likely to be comprehensive or comparable across buildings. The department only carries out more in–depth assessments when there are specific concerns about a particular building. DGS reports that it recognizes the value of facility condition assessments and believes they should be prepared at least every five years but has not done so, largely due to resource constraints. We note that the 2014–15 Budget Act provided DGS with $1.3 million from the General Fund to conduct assessments of state buildings in the Sacramento region. These assessments are anticipated to be completed by the end of March 2015. The department also indicated that it intends to conduct assessments for other buildings statewide, although it had not identified a specific plan for carrying out these additional assessments. Additionally, DGS does not use its existing Maximo system to the fullest extent. For instance, the system is capable of identifying major pieces of equipment that experience higher than normal levels of maintenance, which could indicate the need to replace or conduct more thorough repairs of this equipment. The Maximo system can also be used to identify trends, such as common failures of building components, which might suggest that those components should be monitored more closely, receive additional maintenance services, or perhaps even be replaced. However, the department does not currently take full advantage of Maximo to perform these types of analyses, which would allow it to more fully evaluate the condition of its buildings and effectively manage their maintenance activities. As we reference previously, the department has expressed a desire to utilize Maximo more fully, but is hampered by reduced staffing. Another key best practice related to building maintenance is quantifying expenditures on maintenance. As described previously, DGS does not separately track maintenance spending. Instead, the department tracks spending by category, such as personal services, special repairs, and recurring maintenance, with each category including both maintenance and non–maintenance related expenditures. If the department tracked maintenance spending—both in total and by category—it could use this information to better determine whether its expenditures are appropriate. First, it could compare the maintenance costs of individual DGS buildings to each other to identify if certain buildings are requiring unusually high maintenance expenditures. Second, this information could help the department identify if some buildings or building components require rehabilitation. Third, the department could use maintenance spending information to track maintenance costs over time, which could help identify emerging problems with building systems or staffing issues. Fourth, DGS could compare maintenance spending to the levels spent by other entities to see if it is operating within industry standards. Based on various assumptions, we estimate that DGS spends about $3.60 per square foot per year ($0.30 per square foot per month, or about 13 percent of the average rental rates charged to DGS tenants) on maintenance activities. This spending level appears to be at the higher end of the normal range compared to industry standards. However, this estimate is imprecise because the department’s system is not set up to track expenditures this way. If the system were set up to do this tracking, the department could better estimate its maintenance costs and perform an analysis that would allow it to determine whether its spending levels are in line with industry standards. In turn, this analysis could help tenant departments understand what their rental rates fund and assist the Legislature in making decisions regarding its preferred levels of funding for maintaining these buildings. Another important building management practice is benchmarking performance. Benchmarking involves evaluating performance compared to a recognized standard such as how other government agencies or the private sector operate. One set of standards commonly used by other entities are those developed by the Building Owners and Managers Association (BOMA), which compiles information on the typical staff needs and costs associated with maintaining various types of buildings across the country. However, DGS currently does not use these or other standards to benchmark maintenance spending or outcomes related to maintenance activities. Maintenance activities that are suitable for benchmarking include time frames for completion of preventive maintenance activities or measures of facility conditions. Because DGS does not utilize these benchmarks, it is more challenging to evaluate whether it is operating within industry standards. The department’s current strategic plan identifies the objective of annually comparing the average total cost of operating DGS–controlled buildings (including maintenance) to the private sector (using BOMA standards) and comparing DGS office building rental rates to private sector rental rates. The department last measured its performance against these measures in 2012–13. When the department conducted these evaluations, it determined that its costs of operating buildings and the rental rates it charged were lower than the private sector. However, DGS’ analysis was flawed, making its conclusion questionable. This is because DGS excluded debt–service costs from the rental rate calculations for its buildings. In contrast, private sector rental rates generally include that type of cost since private sector building owners must recover these costs over time through their rates. In this section, we provide recommendations to the Legislature regarding specific actions the department could take to address the contributors to the deferred maintenance backlog identified above and to improve the maintenance practices at state office buildings. The implementation of these recommendations would not only reduce the backlog of deferred maintenance, but also facilitate solutions to the underlying contributors to the backlog. Figure 7 provides a summary of these recommendations. Approve Governor’s $5 million proposal. Require plan identifying strategy for reducing backlog. Evaluate building staffing and set rental rates to meet ongoing building needs. Improve prioritization of maintenance activities. Streamline and add flexibility to contracting process. Benchmark maintenance spending and outcomes. Approve Governor’s $5Million Proposal. We find that since the department’s existing base budget is not sufficient to address the deferred maintenance backlog in a timely manner, additional funding as proposed by the Governor is warranted. While we recommend approval of the $5 million requested, we also recommend the Legislature require DGS to provide a list of the specific projects proposed for funding prior to approval. Consistent with our recommendation in our recent report on the Governor’s deferred maintenance proposal, we recommend that all projects approved by the Legislature be included in the Supplemental Report of the 2015–16 Budget Package and that the budget require DGS to fund only those projects included in that list. However, recognizing that DGS might have to modify the list of projects during the course of the budget year as new needs arise or as cost estimates are refined, we recommend the department be allowed to modify the list included in the Supplemental Report after notifying the Legislature. Require Plan Identifying Strategy for Reducing Backlog. The department has a substantial backlog of deferred maintenance. Thus, we anticipate that DGS will require additional funding in future years to reduce the remaining backlog—likely either through additional General Fund appropriations or through the building rate structure. Ideally, funding would be provided through rental rates, which would allocate these costs more equitably to the General Fund and special funds. If the rate structure approach is used, we note that there are various approaches that could be implemented to achieve this. For example, the rate structure could be adjusted based on individual building needs or across the board. 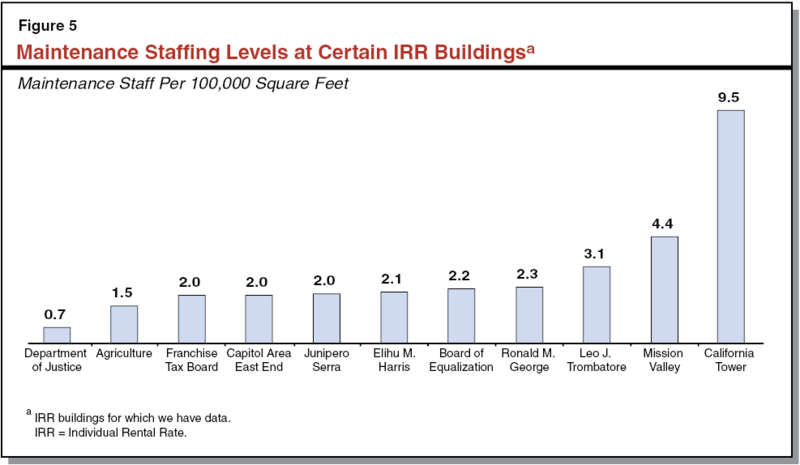 If, for example, additional funding is dedicated specifically to addressing the existing backlog over ten years (roughly $13 million per year), this would necessitate an increase in rates of an average of about $0.09 per square foot per month (about a 5 percent increase for BRA buildings, which currently pay a standard building rental rate of $1.73 per square foot per month). We recommend that the Legislature adopt supplemental report language requiring the department to submit a report by March 1, 2016 with a proposed plan for addressing the existing backlog, including an evaluation of funding options. While it is important to reduce the department’s backlog, the department should also take steps to address the factors that lead to the accumulation of deferred maintenance. Specifically, this should include (1) evaluating building staffing and setting rental rates to meet ongoing building needs, (2) improving prioritization of maintenance efforts, and (3) taking steps to streamline the contracting process. Evaluate Building Staffing and Set Rental Rates to Meet Ongoing Building Needs. We recommend that the Legislature adopt supplemental report language requiring DGS to identify the staffing levels at each state building and DGS headquarters necessary to prevent accumulation of deferred maintenance. The DGS should provide this information to the Legislature by March 1, 2016. This information is important for the department and Legislature to have in order to craft a long term solution to the challenge of deferred maintenance in DGS facilities. We also recommend that building rental rates for both BRA and IRR buildings be set to better reflect ongoing building needs. (We recommend additional assessments of building conditions and needs below.) Given the lack of information on the amount of staffing and other resources that would be required to prevent the further accumulation of deferred maintenance, it is not clear how many additional resources would be needed at this time. If, for example, maintenance spending needed to be increased by 10 percent to prevent the accumulation of additional deferred maintenance, it would likely necessitate a rate increase of roughly $0.04 per square foot per month on average. We recommend that the supplemental report language recommended above also require DGS to identify the level of building rental rates that would be needed to meet ongoing building needs. Improve Prioritization of Maintenance Efforts. We find that DGS should focus more attention on preventive maintenance, especially of high value equipment, in order to reduce the costs associated with putting off this upkeep. In order to accomplish this, the department should regularly evaluate the amount of time it is spending on preventive maintenance and identify how often preventive maintenance is occurring (or being deferred) at each state building. Additionally, the department should actively monitor the number of preventive maintenance items that are being deferred for each building and set goals for reducing (and ultimately eliminating) that number. In order to facilitate its prioritization of maintenance efforts, the department should more fully utilize its Maximo system to direct its resources to building components that are likely to benefit the most from additional maintenance activities or that may merit replacement. For example, the department should regularly run reports to identify equipment that are requiring abnormal amounts of maintenance. We note that this is likely to require hiring additional Maximo staff, which the department could request through the budget process. Streamline and Add Flexibility to Contracting Process. The department already has authority to contract for various activities and relies on contracts for most special repair projects. However, the department faces some impediments to using this contracting authority. We recommend providing the department with authority to use job order contracting for certain types of these projects—such as smaller, relatively straightforward projects like recarpeting and repainting. Job order contracting could enable the department to implement contracts for those services more quickly, freeing up maintenance staff time for other work. We also recommend that the Legislature consider clarifying statute to provide DGS with authority to contract for services in specific situations when they have critical needs that cannot reasonably be met with state staff, such as when they have persistent vacancies. Below, we provide several recommendations to improve the department’s practices related to maintaining state facilities. While these recommendations do not directly address contributors to the accumulation of deferred maintenance, we find that, if implemented effectively, they could assist the department in gathering adequate information and conducting analyses to facilitate more effective maintenance practices. Track Building Conditions. The DGS should systematically evaluate and track building conditions. As mentioned previously, the Legislature provided DGS with funding to complete this assessment work for Sacramento area buildings, and DGS has indicated that it plans to conduct similar assessments of other buildings. However, since it is unclear how the department intends to complete these additional assessments, we recommend that the Legislature require DGS to report at budget hearings on its plan, including anticipated costs and schedules. Additionally, it is important for the department to maintain and periodically update facility assessments so that they do not become out–of–date. Thus, we also recommend that the Legislature require DGS to report at budget hearings on its long–term plan for updating facility condition assessments. We note that the cost of completing these assessments for all DGS buildings is likely to be several hundred thousand dollars annually if all of the state building assessments are rotated over a five year period. Facility condition data, when complete and current, would provide an important resource for prioritizing maintenance spending and making decisions on long–term plans for renovating or replacing buildings. Track Maintenance Spending. We also recommend that the department track maintenance spending separately from other operating costs and report it as part of the budget. It is critical for the department to know how much it is spending because, without this information, it is impossible for it to know if it is investing the appropriate amount of resources in maintenance. Moreover, a lack of spending data makes it difficult to pinpoint potential sources of cost savings. For example, it makes it more difficult to identify buildings or building systems that may be particularly expensive to maintain and may require rehabilitation. We further recommend that the Legislature approve budget bill language directing the administration to separately account for maintenance activities and personnel starting in the 2016–17 proposed budget. Doing so could help inform tenants about what their rental rates fund and facilitate legislative decisionmaking regarding funding of maintenance activities. Benchmark Maintenance Spending and Outcomes. We recommend that DGS annually compare maintenance costs, as well as overall operations costs, to industry standard benchmarks (such as BOMA). Doing so would help the department evaluate whether it is maintaining its buildings consistent with best practices and identify potential areas for improvement. Additionally, DGS should set goals for maintenance outcomes such as facility condition levels and acceptable time frames for addressing preventive maintenance. Setting these goals and tracking progress would help the department better focus its maintenance efforts because it would have clearer objectives. Furthermore, it would help the Legislature hold the department accountable for its progress in meeting these goals and becoming better stewards of the state’s valuable public buildings. We recommend that the Legislature require the department to post online, at least annually, a comparison of its performance compared to benchmarks and its progress meeting its maintenance goals. This information, if provided on a regular basis, would help facilitate legislative decision making on these state assets, as well as assist oversight of the department’s maintenance activities by both the Legislature and also tenant departments. Deferred maintenance is a long–standing and significant issue for DGS–maintained office buildings. The Governor’s budget provides $5 million to begin to address the department’s $138 million deferred maintenance backlog. While we find that the proposal is a worthy first step, there is much more that could be done to address DGS’ deferred maintenance challenges. Accordingly, we recommend that the department develop a long–term plan for addressing the existing backlog. We also identify several contributors to the development of the backlog, including potential understaffing, funding reductions, inadequate prioritization, and contracting challenges. Additionally, we identify several best practices for building maintenance that DGS should employ. Finally, we recommend specific actions for the department and Legislature to take to address the contributors to the backlog and to improve the maintenance practices at state office buildings. Acknowledgments: This report was prepared by Helen Kerstein and reviewed by Brian Brown. The Legislative Analyst's Office (LAO) is a nonpartisan office which provides fiscal and policy information and advice to the Legislature.